Canine transformation is at the forefront of shapeshifting folklore; it seems that there are werewolf legends in almost every country and culture, but for some reason, canine transformation is much more popular than its sister in folklore; feline transformation. For thousands of years, people have believed in the ‘werecat’, i.e., the ability of some sorcerers, witches, demons, to prowl in a giant feline form. During the infamous American witch trials, church officials advised that witches could become cats, –which led to the slaughter of hundreds of thousands of domestic cats in both Europe, and young America. In medieval Ypres, a Belgian municipality, so many cats were hunted and massacred, that there’s actually a national holiday (Kattenstoet) commemorating the events for murdering the animals, –that is still celebrated today. The parade is followed by a mock witch burning; do I really need to comment on the fact that these people are celebrating the death of thousands of innocent people and animals, and turning it into a family event? In Africa, however, werecats and large felines are honored as kings; the ability for humans to shapeshift into feline form is a sign of royalty, –or even of a god or goddess. 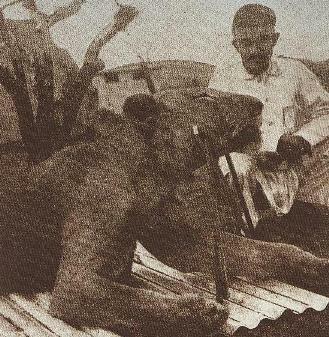 The best example of this traditional belief is shown in Africa’s historical, real life creatures “the man-eaters of Tsavo.” Historical accounts were made that the lions killed and ate over one hundred railroad workers, –sometimes, just killing the men and leaving their bodies, according to historical witnesses. The native railroad workers believed the lions were reincarnated African kings who were trying to stop the invading Europeans by making it impossible for them to build the railroad. 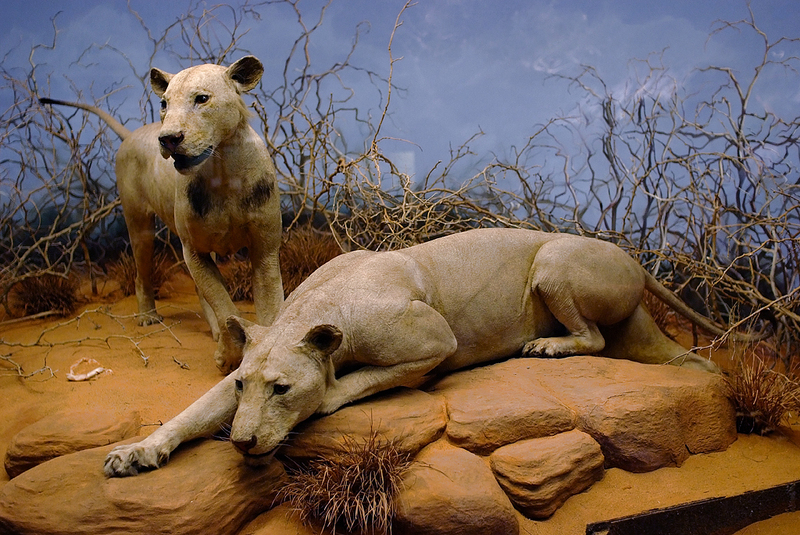 The lions had no manes, and their particular breed, the Tsavo lions, are larger than other breeds of lion, easily giving them a supernatural appearance. The fervor with which they killed men was also unheard of, –lions typically do not venture into a well-lit area, near fire, to hunt for prey. While scientists have studied the possibilities for the lions’ taste for human flesh, no concrete reason has yet to be discovered. The lions were eventually killed by railroad overseer John Henry Patterson, –but both lions had to be shot with a large caliber weapon several times. Patterson used a .303 Lee-Enfield, developed by the British not only for military use, but for hunting specifically in Africa; hunting experts testify to the weapon’s ability to kill pretty much anything aside from large species of bear. The size, behavior, and the extreme difficulty in hunting and killing the two lions, were enough to substantiate the rumors that the two lions were dead kings. Another fact of lions’ social behavior, is that two males of their size do not hunt together. Social regime in a lion’s world is extremely strict; the alpha male rules a pride of females. Rogue lions are either eventually killed, or they overthrow another pride-leader. As a rule of lions’ behavior, two rogue lions do not hunt together. Needless to say, the behavior of the two beasts still baffle animal experts today. They’re on display today in the Field Museum of Natural History, in Chicago, Illinois.